The statistics are alarming: today, 2.25 million men and women – 1 in 100 adults – are in U.S. prisons. 1 in 31 adults, or 7.3 million Americans, are under some sort of correctional supervision. And more than 60% of released prisoners will return to prison within 3 years. To truly help men and women in prison to turn their lives around, we need to do something different. We’re helping incarcerated men and women to build a better life through the Prison Yoga Project’s program of trauma-informed yoga, taught as a mindfulness practice. The practice helps students to restore the connection between their mind, body and heart, experience self-compassion and empathy for others, and take responsibility for their actions. They can also begin to change trauma-induced unconscious behavioral patterns and develop skills for impulse control, reducing the likelihood that they will return to jail. A chance to heal and transform through yoga and mindfulness. 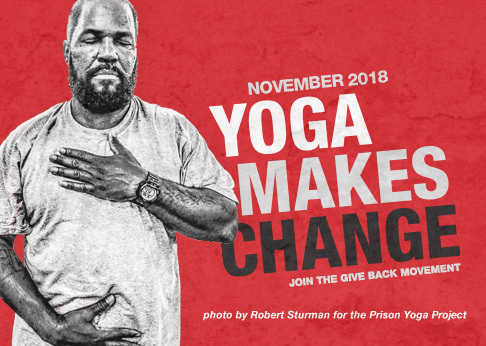 The Prison Yoga Project is built on the belief that incarcerated men and women deserve a chance to heal the harm caused by themselves and others, and to improve their own lives. Founder James Fox has taught yoga and meditation to male prisoners at California’s San Quentin State Prison for well over a decade, and has worked at numerous other prisons and rehabilitation centers for at-risk youth. Today, 1,800+ teachers worldwide have been trained in Prison Yoga Project’s trauma-informed methodology. The program has been replicated in 335 correctional facilities in 27 states, with three additional international chapters working overseas. Two practices guides designed to aide the healing of incarcerated men and women. To have a real chance at creating a peaceful and meaningful life, men and women in prisons or rehabilitation centers need help to heal from unresolved trauma and learn skills for non-violent problem resolution. Give Back Yoga has helped to fund the publication and distribution of Prison Yoga Project: A Path for Healing and Recovery and A Woman’s Practice: Healing from the Heart. Today, more than 26,000 free copies of A Path for Healing and Recovery have been shared with prisoners, giving those behind bars a tool to support a healing personal practice. Recently, the book was translated into Spanish, and trial distribution has begun in Mexico. Share the psychologically therapeutic benefits of yoga and mindfulness meditation. Join Prison Yoga Project founder James Fox to learn evidence-based yoga, pranayama and meditation practices that have been proven effective for prisoners, as well as strategies for establishing trauma-informed yoga classes in detention centers, rehab facilities and more. Prison Yoga Project’s unique weekend trainings investigate the practical application of yoga for emotional and psychological issues, including PTSD and train students on specific asana, pranayama and meditation practices that have been proven effective with prisoners. Our Goals: Help us to put free practice guides in the hands of another 20,000 prisoners by making a donation to Prison Yoga Project. For just $10, we can provide a prisoner with one free copy of A Path for Healing and Recovery or A Woman’s Practice: Healing from the Heart, offering a valuable tool to support healing and positive growth.